Charlotte, NC – Just when the Carolina Panthers had a great opportunity to make a statement – on prime time – they flopped. Just when they had a chance to come out and show the defending Super Bowl champs what they were made of, they flopped. The New York Giants crushed the Panthers 36 – 7 before 73,951 at Bank of America Stadium in a game that was not that close. Thursday night’s game began just like the first two Panthers games – with the opposing team driving 80 yards for a touchdown. But this time, the Giants did not let off the gas. Playing several starters short, this one was ripe for the picking (for Carolina), but the G-Men showed what they usually do – they play their best football when their back is against the wall. 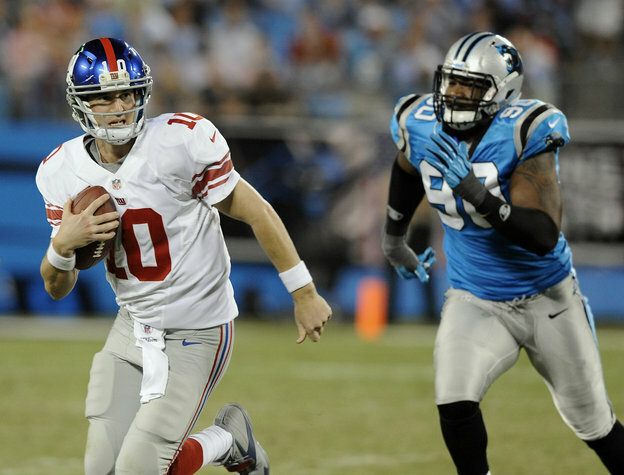 New York Giants quarterback Eli Manning runs past Carolina Panthers defensive end Frank Alexander during Thursday night’s game. Barden finished with nine receptions for a game-high 138 yards. Backup running back Brown ate up 113 yards, slashing the Panthers’ defense for gains of 31, 16, 19 and 14 yards throughout the game. Imagine what the Giants would have done with their first-teamers. 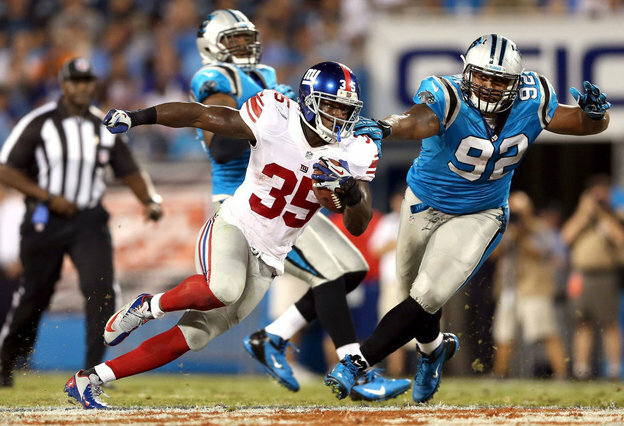 Not bad for a backup…New York Giants running back Andre Brown slashes past Carolina Panthers defensive lineman Dwan Edwards during Thursday night’s 36-7 win for the Giants. Coming off a short week, the home team usually has the advantage. The Panthers were favored in this one, and deservedly so. After a huge win against the New Orleans Saints on Sunday, the Panthers apparently forgot how to tackle. And how to get pressure on the opposition’s quarterback. Manning, the two-time Super Bowl MVP, picked apart the Panthers for 288 passing yards. With the Giants missing their starting running back, offensive tackle and star wide receiver to injuries, you’d think Carolina’s defensive front four would have had an easier time handling the Giants offense. “We lost focus,” Panthers defensive end Greg Hardy said. “It got away from us and we didn’t punch them back. They came out and did what we expected them to do. They played a high level of football and we couldn’t come back. We had no counter. Coach Ron Rivera said the Panthers are still young on both sides of the ball. The average age of a Panthers’ player is 24 with four years of NFL experience – both of which are below the NFL averages – and the team still has trouble figuring out how to fight back for a win. Carolina Panthers rookie cornerback Josh Norman was targeted early and often by New York Giants quarterback Eli Manning. On this play, Norman, who was burned often during the game, got the better of Giants receiver Ramses Barden, deflecting a potentia touchdown pass away. Usually reliable linebackers Jon Beason and Luke Kuechly missed makeable plays. Rookie cornerback Josh Norman was targeted early and often by Manning…and it paid off. He was repeatedly burned. The linemen were not effective, other than defensive end Charles Johnson…but he was only able to get pressure early in the game. Hardy struggled to beat his man off the line and Ron Edwards was a non-factor. 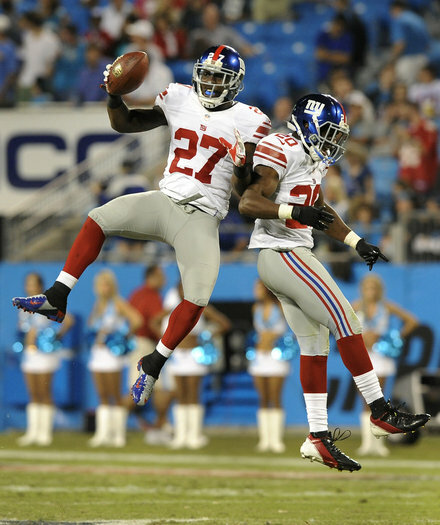 Adding to the frustrations of the night…New York Giants’ Stevie Brown (27) and Prince Amukamara (20) celebrate Brown’s interception of a Cam Newton pass during the Giants’ 36-7 win in Charlotte. When they were not scoring touchdowns, Giants kicker Lawrence Tynes was killing the Cats. He had five field goals on the night, improving on the four he had Sunday against Tampa Bay. A frustrated Carolina Panther – quarterback Cam Newton looks at the scoreboard during the fourth quarter of Thursday night’s 36-7 loss to the New York Giants. 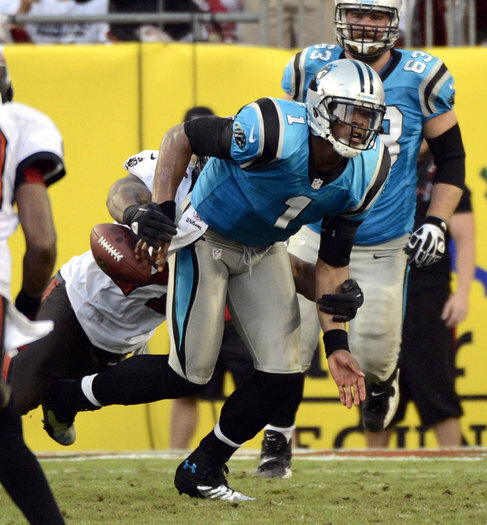 Offensively, Panthers quarterback Cam Newton was ineffective. His quarterback rating was 40.6, compared to Manning’s 110.2. His favorite target Thursday night was tight end Greg Olsen, who had 98 receiving yards, his high as a Panther. Newton, by the way, has never won a game in which he throws an interception. He is now 0-11 throwing an interception in 19 starts. Charlotte, NC – A quick turn-around is in store for the Carolina Panthers and the New York Giants as each gets ready for battle in the NFL’s Thursday Night game in Charlotte. Fresh off a 35-27 defeat of the defending NFC champion (New Orleans), the Panthers now get the defending Super Bowl champions in the nationally televised game (NFL Network) at Bank of America Stadium. The biggest defensive plays were the bookend interceptions. Early in the first quarter, safety Charles Godfrey returned one for a touchdown that tied the game and slowed the Saints offensive momentum. The second interception came with less than a minute to play when linebacker Jon Beason intercepted a Drew Brees pass which sealed Carolina’s win. If the Saints offensive juggernaut rolled up 486 yards, how will the Panthers defense slow down the New York passing attack that gained 510 yards against Tampa Bay last Sunday? A lot of the responsibility falls on the linebacking corps – Beason, rookie Luke Kuechly, James Anderson and Thomas Davis. Returning from injuries, Beason and Davis are a welcome addition back to the defense and Kuechly has stepped in nicely. Overall, the Carolina defense has six new starters from last season when they finished 28th in yards allowed and 27th in points surrendered. The offense, however, returned nearly everyone, and rebounded nicely last Sunday, accumulating 463 yards against the Saints following a disappointing effort in Tampa the week before. Cam Newton is the Carolina Panthers quarterback…and a great option to run the ball. He gained 71 yards Sunday against the Saints, making up for his tough opening game at Tampa. The biggest improvement came in the running game. Carolina gained just 10 yards in the opener, but rushed for 219 Sunday. Quarterback Cam Newton (71 yards) and running backs DeAngelo Williams (69 yards) and Jonathan Stewart (51 yards) came up big. Newton also completed 14-of-20 attempts for 253 yards and a touchdown. 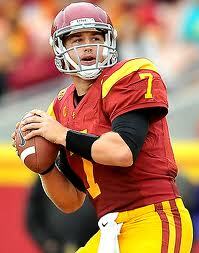 He now has a 100.8 quarterback rating for the first two games of the season. Big plays were the spark needed for the offense Sunday against new Orleans. 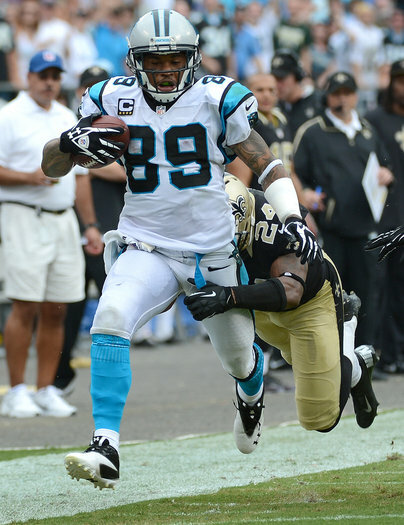 Receiver Steve Smith’s 66-yard reception after the Saints closed to within one score in the fourth quarter was the play of that drive in which the Panthers scored their last touchdown. Smith had three receptions for 104 yards, marking the second straight week and 40th time in his career he has surpassed 100 yards in a game. 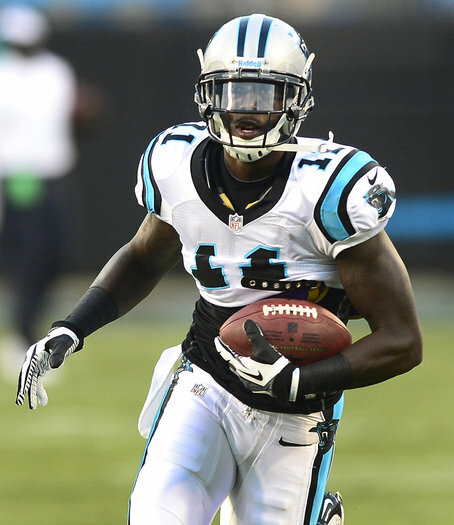 Carolina Panthers third-year wide receiver Brandon LaFell could be enjoying a breakout season. Third-year receiver, Brandon LaFell, is gaining in confidence. 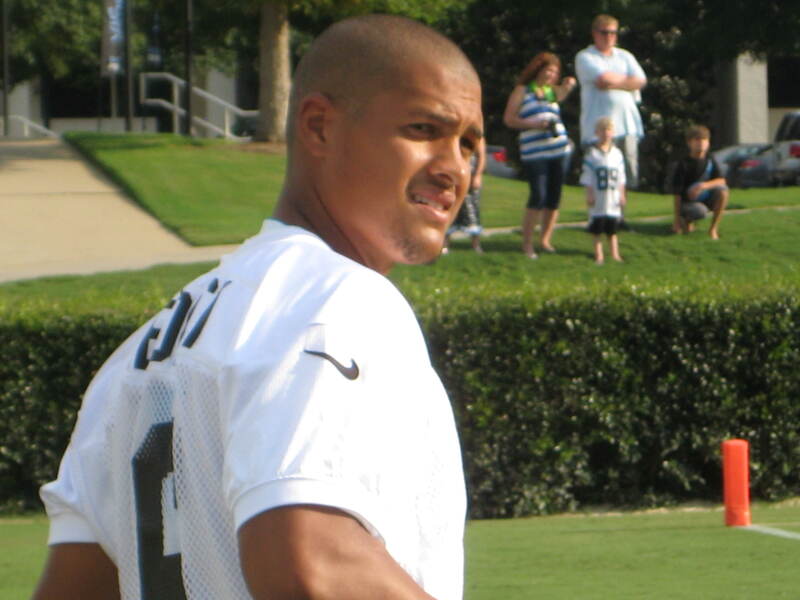 He had an outstanding training camp and during the season, is averaging 17.2 yards per catch. He caught six for 90 yards against the Saints. His 25-yard run on a reverse got the Panthers in position for their final touchdown drive of the first half. 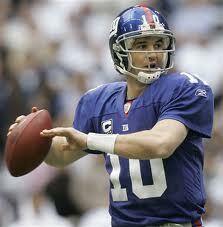 New York Giants quarterback Eli Manning put up over 500 yards passing Sunday against Tampa. The Carolina Panthers defense must find a way to slow him down or it will be a long night on Thursday. Now come the Giants and quarterback Eli Manning. Both teams are playing on a short week, which always is challenging…for the players and coaches. This will be the eighth time the Panthers and Giants have met, with Carolina leading the all-time series, 4-3. Rookie cornerback, Josh Norman (Coastal Carolina) has supplanted fourth-year starter Captain Munnerlyn in the season’s biggest surprise, so far. While he is not happy about losing his starting job, Munnerlyn said, “I’m good with it. But it’s a part of football. I know they need me on special teams.” Munnerlyn, a starter last year and for much of 2012, has been relegated to the nickel package and special teams as Norman grows stronger each week. Right tackle Byron bell (ankle sprain): Rivera said if Bell does not start, Garry Williams, who has gotten the bulk of the first-team reps this week, would be the likely starter, but Bruce Campbell has also gotten work in practice this week. The rest of the Panthers injury report shows backup guard/center Mike Pollak (shoulder) is out. Linebacker Thomas Davis (hamstring) and special teams player Colin Jones (shoulder) are questionable, although Rivera said Davis has a good chance of playing. Linebacker Jon Beason (elbow), C Ryan Kalil(ankle), WR Steve Smith (knee) and WR Kealoha Pilares (foot) are probable. Steve Smith (knee) is listed as probable although Rivera said listing Smith on the injury report “is really more of a formality now than anything else.” Smith was limited in Tuesday’s practice, but fully participated on Wednesday. On the other side of the ball, Giants running back Ahmad Bradshaw, right tackle David Diehl and wide receiver Domenik Hixon have been ruled out of Thursday night’s game. This is one of those games where I predicted an upset for the Panthers when the schedule came out. I also thought they would be 2-0 at this time (yes, I missed on the Tampa game but correctly predicted the upset win over the Saints). I think this will be a very high scoring game. The over-under is 50.5 points, which is attainable. Each team’s offense is getting better as we go into Week 3. Stopping Eli Manning is a very formidable task, and the same goes for Cam Newton. It seems like every game is a big one in the NFL…especially, so far, for the Panthers. After losing to Tampa in their opener, last Sunday’s game was a “must-win” due to the fact that they were playing the Saints, an NFC South division rival. Thursday night’s game, while big, does not have that “must-win” feel to me. The line opened favoring the Giants by 2.5 points and has now dropped to Carolina plus 1 and even a pick ’em game at some books. Even though it is a home game for Carolina, I’m going with the Giants by a field goal in this one. But I hope I’m wrong. Charlotte, NC – The Carolina Panthers knew Sunday’s game against NFC South division rival New Orleans was a huge one.Coming off a disappointing offensive effort in their season opener at Tampa, the Panthers won a must-win game before 72,879 fans at Bank of America Stadium. Last week, the running game was anemic in Tampa. 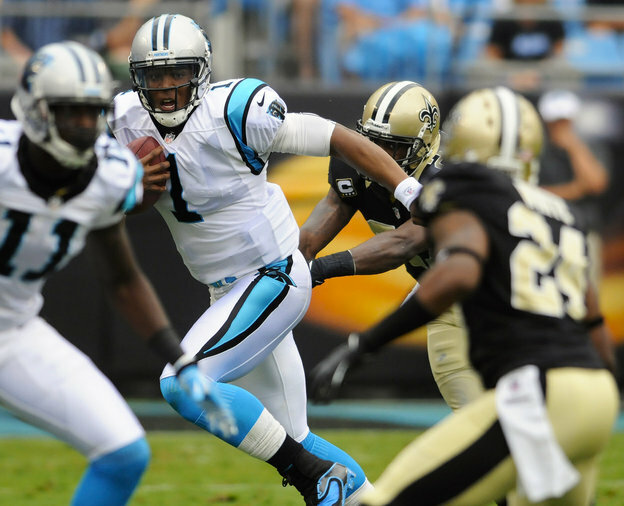 This week, the Panthers had a 2-to-1, run-pass ratio against the Saints, with 41 rushes and 20 passes. Each member of the Panthers’ backfield scored a touchdown. 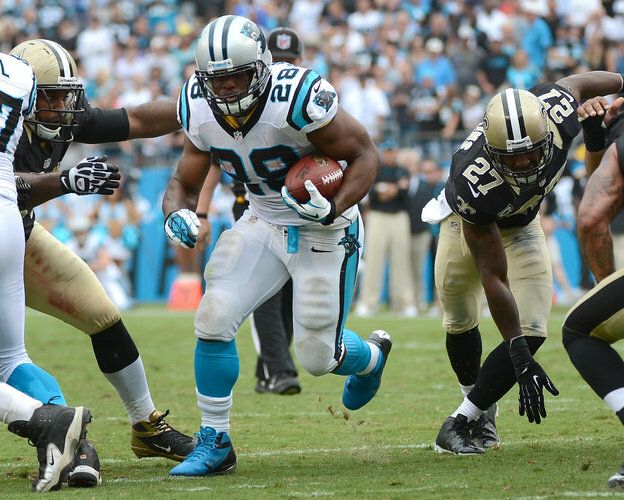 Carolina Panthers running back Jonathan Stewart ran for 51 yards against New Orleans on Sunday. So did the Panthers’ defense. 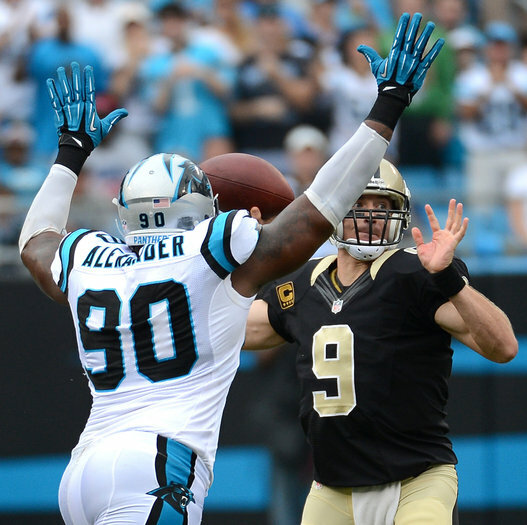 Carolina Panthers defensive end Frank Alexander hurried New Orleans Saints quarterback Drew Brees several times and batted this pass attempt down. Carolina Panthers safety Charles Godfrey intercepts New Orleans Saints quarterback Drew Brees on Sunday. This time, it was different…very different. 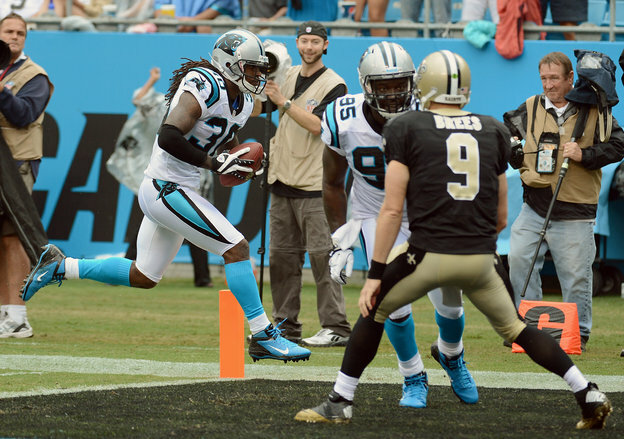 Safety Charles Godfrey’s interception got the Panther going…and linebacker Jon Beason ended the Saints’ comeback hopes. With the Saints at their 29 with 31 seconds left, Beason – playing deep middle – cheated toward Graham’s side and Brees never saw him. Carolina Panthers quarterback Cam Newton ran for a personal-best 71 yards and completed 14 of 20 passes for 253 yards and a touchdown, and finished with a quarterback rating of 129.2. Offensively, the Panthers made the home crowd very happy. Quarterback Cam Newton had a great day, completing 14 of 20 passes for 253 yards and a touchdown, and ended up with a quarterback rating of 129.2. Additionally, he rushed 13 times for 71 yards, a personal high. One reason for the great numbers…the zone read offense. The Redskins ran the zone read during a 40-32 win at New Orleans in Week 1, rolling up 459 total yards behind rookie quarterback Robert Griffin III. The Panthers beat that…with 463 total yards. And…the Saints also rolled up some impressive yardage numbers – 486 – but the final numbers that counted were on the scoreboard. 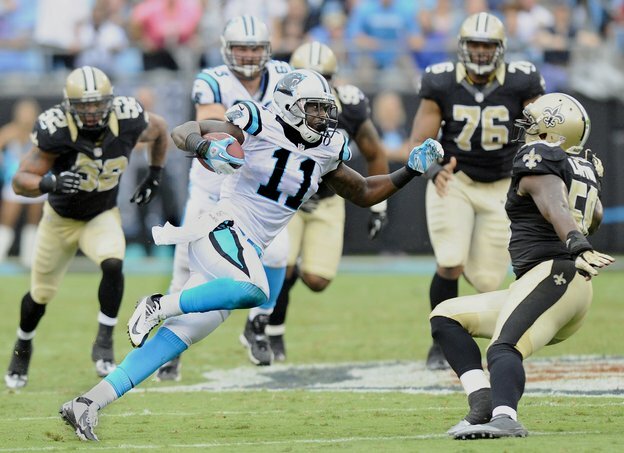 Carolina Panthers receiver Brandon LaFell had a breakout day Sunday against the Saints. Coach Ron Rivera came over to LaFell’s locker after the game and held a handshake for an extra few seconds. “Good game,” Rivera said. LaFell had an outstanding training camp and has benefitted from the extra work he put in prior to the season. “Man, it felt great today. We got out there and got into a rhythm,” LaFell said. “Cam found me a lot today. We just got out there and made plays. I got real confident early because I kept getting the ball and I kept continuing to roll. LaFell remained humble despite having a breakout game. For instance, he did not ask Newton to look for him more often. Carolina Panthers receiver Steve Smith went 66 yards on this catch. He and Brandon LaFell have the potential to be one of the top receiving duos in the league. Rivera saw Sunday what he and offensive coordinator Rob Chudzinski envisioned with Smith and LaFell on the outside. Smith is in his 12th NFL season, LaFell two games into his third season. For LaFell, who attended Louisiana State, it was an especially satisfying Sunday. “All (Saturday) and all (Sunday) morning, I’m getting text messages from roommates and old friends I went to college with (saying) the Saints are going to whoop y’all. They said we’re pulling for you but we’re pulling for the Saints,” LaFell said. Panthers’ wide receiver Steve Smith said the reason LaFell has become so valuable is simple. “Ever since Moose (Muhsin Muhammad) retired and also with Ricky (Proehl) retiring, we’ve been looking for a guy to step in and step up. I think Brandon has done that,” Smith said. LaFell and Smith took advantage of the Saints’ coverage, getting open and combining for 194 receiving yards. And with that, the Panthers ended a four-game losing streak against the Saints. New Orleans has been the class of the division recently, but with the fallout from Bountygate (loss of coaches and players), Smith suggested there could be a changing of the guard in the division. Really quickly…like in four days when the Panthers host the defending Super Bowl champions, the New York Giants, on Thursday night. 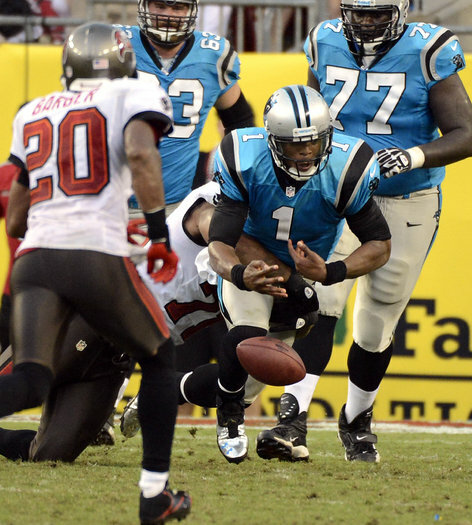 Tampa, FL – The 2012 NFL season did not begin at all like the Carolina Panthers envisioned. Even before kickoff, Carolina knew division rival New Orleans had already lost its opener to the Washington Redskins and this was a golden opportunity to gain a game in the standings before the two teams meet next Sunday in Charlotte. 10 total rushing yards by the Panthers, tying a team record for the fewest in a game (vs. New Orleans in 2000). -1 yards rushing for tailback DeAngelo Williams on six carries. 2 third-down conversions, in 10 attempts, for the Panthers. 83.3 Cam Newton’s quarterback rating. 95.5 Josh Freeman’s quarterback rating. All week, the Panthers practiced in dry (yet humid) conditions at the IMG Academy in nearly Bradenton. Unfortunately on Sunday, they encountered a wet track due to early rains, and a lightning storm with heavy rains during halftime (which caused the NFL to clear the stadium and delay the start of the second half). Carolina Panthers’ running back DeAngelo Williams looks for some room to run against Michael Bennett and Tampa Bay’s defense. Without his running back partner Jonathan Stewart (DNP – injury), Williams was held to a career-low -1 yards in Sunday’s opening game at Tampa. Abandon the run? What run attack was he talking about? Receiver Kealoha Pilares was the Panthers’ leading rusher with 5 yards, gained on an pitch from Newton on a zone-read play. With Jonathan Stewart out with a sprained ankle, Williams tied his career low. 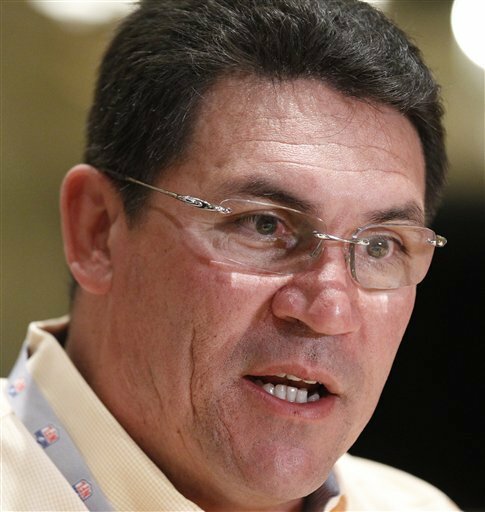 Coach Ron Rivera said the Bucs showed different fronts than they had in the preseason under new head coach Greg Schiano, the former Rutgers coach who replaced Raheem Morris. Tampa Bay showed a much more aggressive defense in the opener than they had last year…that’s the influence of the new coaching staff. If they continue to play like they did against the Panthers, the NFC South just got a whole lot tougher. Newton, the AP Offensive Rookie of the Year in 2011, was 23-of-33 for 303 yards, with one touchdown and those two interceptions. 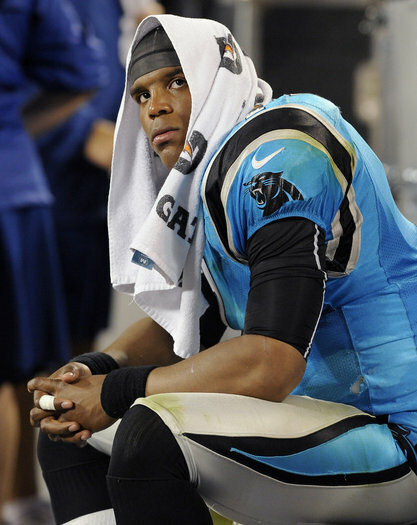 The Panthers still have never won a game in which Newton has thrown an interception, falling to 0-10. Carolina Panthers QB Cam Newton is sacked by Tampa Bay’s Michael Bennett during Sunday’s opening game at Tampa. Trailing 13-0 at the half, the Panthers’ defense came out after the extra-long intermission and forced Tampa to punt. Then, Newton and the offense started moving the ball on their first possession. He was 4-for-4 on the drive, and his last three throws were all clutch. He hit tight end Greg Olsen for 11 yards on third-and-5, found Steve Smith for 32 yards, then hit a wide-open Brandon LaFell for a 22-yard touchdown pass on a play Newton sold with a play-action fake. But Newton could not maintain the momentum. He was intercepted on the Panthers’ next two series after throwing into coverage. The first interception came one play after rookie kick returner Joe Adams gave the offense its best starting field position with a 21-yard punt return to the Bucs’ 41. Newton was looking for LaFell, but cornerback Aqib Talib deflected the ball and safety Ronde Barber grabbed the ball out of the air for the first interception. Newton was more upset with his second interception – a floater down the sideline to Smith that safety Ahmad Black tracked down. Another piece of the puzzle that just didn’t work were the Panthers’ special teams. Last season, special teams were a major problem. All throughout the off-season, they worked to improve them through the draft and free agent signings. Unfortunately, they broke down against Tampa. The line needs to do a better job of protecting their punter. Miscommunication on the protection allowed Talib to come off the left end untouched and block rookie Brad Nortman’s punt, setting up the last of Connor Barth’s three field goals. After the game, tight end Olsen had an idea for what the Panthers could do with their season-opening loss. “Throw away a lot of it,” he said. Olson caught six passes for 56 yards, but seemed frustrated by the offense’s inability to generate consistency and points against the Bucs. Penalties and interceptions hurt Carolina. Panthers’ cornerback Captain Munnerlyn committed a huge penalty in the first quarter that just continued to give Tampa Bay momentum. Munnerlyn was flagged for fair catch interference when he slammed into Tampa Bay’s Sammie Stroughter, who was running up to field a short punt. Couldn’t have put it better myself. With a very angry New Orleans Saints team coming to Charlotte for Week 2, the Panthers have to right the ship…and do it quickly. They need to have their leader, Cam Newton, make smarter plays. Yes, he’s flashy and puts up incredible numbers. But his mistakes are costing the team wins. “He did make some mistakes and it was, at times, unlike him,” Rivera said. Rivera also credited Newton for several of his second-half throws. Again, like the running game, the line did Newton no favors. He was sacked three times and hurried other times. An NFC South battle next Sunday (against New Orleans) with both coming off embarrassing losses, in my opinion, should be a great match-up. The NFL season is a long one…for a reason. No team thinks they are done already. Last season in Week 1, the Bears beat the Falcons…the Steelers lost by 28 and the Giants lost to a dreadful Washington team by two touchdowns. No one goes undefeated in the NFL. The Panthers are a talented team with a lot of expectations on their shoulders. How they answer next Sunday will determine a lot. And with their next three games (Sunday’s vs. the Saints; Thursday night at home against the Giants and a road game at Atlanta) being equally tough…this team can be 0-4, 1-3, 2-2 or 3-1 by the end of September. We should know a lot about the character of this team by then. 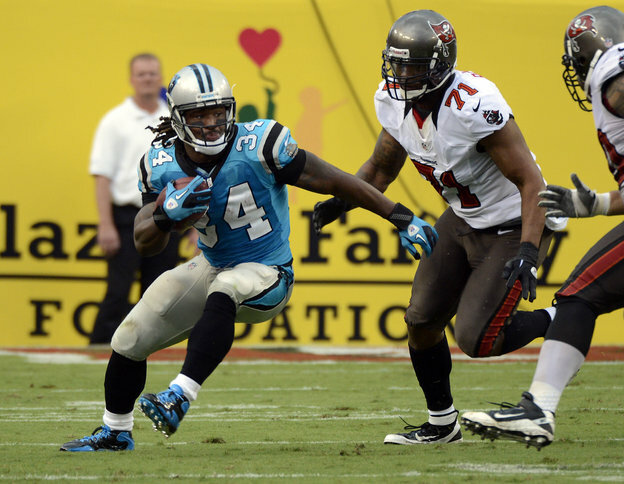 The Carolina Panthers open the 2012 regular season with an NFC South divisional rival as they travel to Tampa Bay to play the Buccaneers on Sunday. This marks the first time the two teams have opened the season against each other. Because of the Democratic National Convention taking place in Charlotte, the Panthers began preparations for the game on Tuesday in Bradenton, FL at the IMG campus. Will Carolina Panthers QB Cam Newton suffer from the sophomore slump? I doubt it! Quarterback Cam Newton, last season’s offensive rookie of the year, heads a potent offense that finished fifth in the League in points, and most of his offensive teammates also return. Guard Travelle Wharton and tight end Jeremy Shockey have left the team, but the team is very confident that second-round draft pick Amini Silatolu (replacing Wharton) and former back-up tight end Greg Olson will pick up the slack. Offseason acquisition fullback Mike Tolbert also replaces Shockey. In addition to Newton’s terrific season (accounting for 35 touchdowns – 21 scoring passes and an NFL quarterback record 14 rushing touchdowns), veteran wide receiver Steve Smith returns. Smith has moved to the top 36 career receivers in receptions and receiving yardage, caught 79 balls and had 1,394 receiving yards in 2011. Smith will look to extend his streak of 75 consecutive games with a reception, which began in 2006. He has played in 151 career games and with six games played, he will rank second in team history, passing Brad Hoover and Muhsin Muhammad. Pro Bowl center Ryan Kalil, the author of a full page ad that ran in the Charlotte Observer in July declaring the Panthers will win the Super Bowl this year, heads the offensive line that returns four of five starters. Rivera is speaking of receiver Brandon LaFell, who had an excellent preseason, tackle Byron Bell and the big fella, Newton. LaFell, now in his third season, started the final six games last year and Bell started 12 as a rookie after moving into the lineup due to injuries. On the defensive side of the ball, there are more changes, but good ones. Linebacker Jon Beason returns after missing the entire 2011 season with a torn Achilles suffered in the opening game at Arizona. He missed much of the preseason with a pulled hamstring, however. Thomas Davis, who has been attempting to come back from three ACL surgeries after missing the last 2-1/2 years, played in only one preseason game (against the New York Jets), but looked good. Rookie Luke Kuechly, the team’s No. 1 draft choice, had a strong preseason and will be a starter at linebacker on Sunday. After backing up All-Pro safety Ed Reed in Baltimore, newcomer Haruki Nakamura will also begin the season as a starter. One of five potential new defensive starters, he was impressive in the preseason and knows what it takes to get to the championship game, as he did with the Ravens. Other potential starters are defensive end Charles Johnson, linebacker James Anderson, cornerback Chris Gamble and safety Charles Godfrey, all back from last year, will try to improve upon the 28th ranked defense (in yards allowed) last year. “We saw some good signs of progress in the preseason and now have to transfer that into the regular season while continuing to improve,” said Rivera. Carolina Panthers’ rookie kicker Brad Nortman won the punting job beating out veteran Nick Harris. Carolina Panthers placekicker Justin Medlock beat out incumbent veteran Olindo Mare during camp this year. .
One area the Panthers worked during the offseason to improve upon were the special teams. Carolina drafted its first punter, Brad Nortman, and he averaged 48.2 yards per kick in the preseason. Placekicker Justin Medlock, with just one NFL game under his belt, but with three solid years of CFL experience behind him, beat out incumbent veteran Olindo Mare for the position. His strong leg was the difference. Kick returner Joe Adams, is a quick (and fast) player who has the potential to change games in a hurry. These three specialists should give the Cats a big improvement over last season’s dreadful special teams. The Panthers and Bucs have met 23 times previously, with the Panthers holding a 14-9 edge. The game will mark head coach Greg Schiano’s debut in the NFL. He is the ninth head coach in Buccaneers’ history, and was the head coach for Rutgers University for the past 12 seasons. Every season is a fresh start, but…on December 24, 2011, the Panthers came of age, beating Tampa Bay 48-16 at Bank of America Stadium in Charlotte. This year every team begins anew, but on paper, the Panthers look to be much stronger. The Panthers made two new additions to their roster as the team reached the NFL’s 53-man active roster limit for the regular season. The team acquired safety Colin Jones from the San Francisco 49ers on Friday, August 31, in exchange for an undisclosed draft choice and signed defensive tackle Dwan Edwards on Sunday, Sept. 2. Jones is a second-year player from TCU, who played 13 games for the 49ers last season, seeing action primarily on special teams (a glaring weakness on the Panthers part last year). Edwards is in his ninth NFL season, having played the last two in Buffalo, where he started 24 of 27 games for the Bills. His career began in Baltimore where he played six seasons for the Ravens after being selected by the team in the second round (51st overall) in the 2004 NFL Draft. Having seen this team play four (okay, three…we all know the fourth preseason game is a joke) games and having watched many practices, the Panthers are going to be much improved from last year. The only problem…their division rivals, the New Orleans Saints and the Atlanta Falcons are also improved. The Saints, in fact, just got a whole lot better, as their previously-suspended players were granted amnesty and all of them, including All-Pro Jonathan Vilma, are eligible to play beginning Sunday. The Panthers improved to 6-10 last season (they had nowhere to go but up) and Cam Newton’s level of play shocked nearly everyone. Newton is poised to be even better this season, and has the weapons he needs to lead this team to the top. Looking at their schedule when it first came out, I said the team would win 10 or 11 games. I am sticking with 10 wins this season, but even that could be a stretch. The opener is one of those games they must win, because the next three games (New Orleans, New York Giants, at Atlanta) could all be losses. Their fate in the NFC South Division could be sealed by the end of September, but, should they win two of those three games, the Panthers will have put their divisional rivals on notice…as well as the rest of the league. I am confident the Panthers will prevail, 24-10, in the opener. Today, the best of both worlds…NCAA and NFL football. Both the college kids and the pros have full slates this weekend. Last week, NCAA games drew great numbers of fans to television screens and stadiums (except at Maryland, where only 31,000 – they say – fans cheered the mighty Terps onto a 7-6 win over Bill and Mary). So today, let’s start with the college game. Simply stated, at the end of last season, I said USC (yes, THAT USC…the one in Southern California, not South Carolina) would win the 2013 BCS title…and I am sticking with it. This week, they go into the Meadowlands to play Syracuse. Hardly a fair fight, but at least the folks in the East will get a chance to see the Heisman-frontrunner, SC quarterback Matt Barkley in person. It won’t be as grizzly as Florida State-Savannah State, but the men of Troy will prevail. I do like my Alma Mater, MIZZOU, to upset Georgia tomorrow in Columbia. I said it as soon as the schedule was announced, so I cannot go back on my word now. Yes, Georgia is good…but I think the Tigers will really be up for this special once-in-a-lifetime game. In the Brainiac Bowl, shouldn’t there be a spelling bee or a math contest here? Both teams want to play big-boy football…but it’s the Commodores that will rule this one. Head Coach James Franklin has everyone believing they are good…and they are. They could have beaten USC (no…the one from Columbia, SC with the Ol’ Ball Coach) last week…so they are a serious team. And out west, I think Nebraska will bring smiles to their hordes of fans who travel to UCLA to see Big Red win. The Huskers have fallen in early West Coast games before, but I think this is a different team and I expect big things from them. Huskers…big…over the Uclans! In the NFL, we had a great opener (getting a fantastic 16.8 rating) on Wednesday night as the defending Super Bowl champs, the New York football Giants lost to Dallas. The Giants were not that bad…in fact, they are pretty good. If not for a horse-collar tackle by the end zone (yes, a correctly-called penalty against Dallas) and a couple of dropped balls by Victor Cruz, the game could have gone the other way. In the battle of Convention cities, there’s too much Cam Newton…even if RB Jonathan Stewart does not play, the Panthers are the better team. Jon Beason returns to linebacker, and he is joined by first-round pick Luke Kuechly, who is much better than you think, plus my friends, both of whom I predicted would beat out veteran, incumbent kickers, P Brad Nortman and PK Justin Medlock, are keys to the win. Panthers (-1) by 7 points. Great storylines on both sides…those of you who have followed my writing know how high I was on Robert Griffin III (from now on, RGIII) for the past two years while he was at Baylor. The Heisman winner leads the Redskins into the future…but not Sunday. He needs a lot of help…and he will be running for his life at times as the Saints take all their venom out on the undermanned Redskins. It was bad enough to lose your head coach for a season, your first interim coach for six games…but add to this the wrath of Hurricane Isaac…and the Saints are once again playing for the city of New Orleans. NOLA will survive…the Skins, not so much. Saints (-7) win by 17 points. We’ve all been “wowed” by the enthusiastic new head coach of the Dolphins (yawn), Joe Philbin. Seems like a very, very nice man. Should be my accountant. I’m no expert, but I have yet to see the man raise his voice. New QB Ryan Tannehill returns to the Lone Star State, where he played his collegiate ball (Texas A&M), but he’s not facing KU or Texas this time. He’s facing a terrific defense and a very, very good team, with high expectations. No worries, Houston. The Texans (-12) also win by 17 points. So there you go…the weekend outlook for six games, NCAA and NFL…hope you enjoy your viewing!